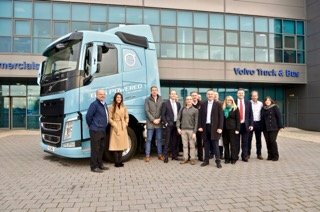 As new truck launches go the Irish reveal of the latest model Volvo FH was a relatively low key event. Nevertheless, if the latest edition to the Volvo Truck series, which by the way celebrated its silver anniversary last year, proves popular in Ireland, the launch day could be remembered as one of historic significance. 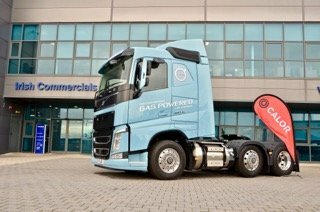 The reason is that the new FH with its D13 engine is gas powered, and interestingly with Liquified Natural Gas (LNG). This is somewhat unusual as there are no LNG filling stations in Ireland, as yet. At the launch were representatives from Calor which is currently developing plans to rollout an LNG refuelling network at a number of key locations across the country. For LNG suppliers one important advantage with this gas is that it can be delivered to a location and does not need to be on the regular gas (mains) network, which of course adds great flexibility when selecting potential locations. The first station located at Dublin port is expected early this year. The event attracted a number of interested operators to Volvo Truck dealer Irish Commercials. They came to hear how the infrastructure is developing, and to see how LNG might work in their business, and what are the timelines to realise a reasonable return on the investment.